"The impact on the national economy is crucial. In a large part of the world's countries, air transport has a large share in Gross Domestic Product (GDP). I want to do the same. With the increase in the number of services, the number of passengers using the air transport, we will also have a greater contribution to GDP formation. " The statement was made today by the Minister of Economy and Infrastructure, Chiril Gaburici, on the launch of a new runway at Chisinau International Airport. At the same time, the Minister of Economy and Infrastructure added that any country wishing to be in a better rating in the international Doing Business report should offer more opportunities to all economic agents. "Once with the launch of a new project, we will certainly grow and offer opportunities to those who have business in the Republic of Moldova, and thus we will improve our position in the international report on the opportunities for developing a business," said Chiril Gaburici. The Minister of Economy and Infrastructure mentioned the positive results of the management of Avia Invest, which carried out the project to build a new runway at Chisinau Airport, with a length of 2 thousand 500 m and a width of 45 m, with a working term up at the age of 30. "I am glad to see all those involved in the development of air transport, who have implemented a large infrastructure project, building a new runway at Chisinau International Airport, but also the colleagues from companies that offer services for air passengers and congratulate them with this achievement, "the Minister of Economy and Infrastructure said. 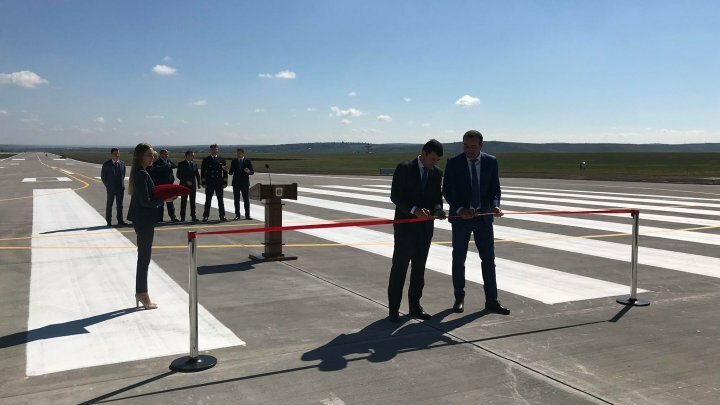 During the event, the authorities mentioned that the reconstruction of a new runway for take-offs and landings in line with European standards was carried out by the company, experienced in the field, and carried out such projects at major European airports. The track is equipped with a high quality lighting system and a modern light beacon system, providing aircraft with reduced visibility. The track is also equipped with radionavigation equipment, allowing landing from any angle and direction, so airlines will benefit from reduced flight times and fuel economy.